I can't take complete credit for this birthday post. My daughter turned my simple idea for an activity into something really special for her great-grandparents. In fact, this wasn't the only time this week that I was impressed by the ideas of children. I was lucky enough to have a few children check out one of my current book projects. Their ideas helped me make a few key changes to my illustrations which really improved those pages. I find the creativity and thoughtfulness of children quite amazing. Jim Aylesworth learned what makes a great picture book from the children he encountered during his 25 years as a teacher. "Rhythm, rhyme, and repetition are three of the elements that young children like best in their books. I learned that this is true by reading hundreds and hundreds of books out loud to my students." (Ayles.com). His biography page on his website shares more about the influence his students had on his writing. "Their enjoyment of his stories encouraged him to persist in pursuing his dream of being a children's book writer. It was in the classroom that he realized the power of books." He also credits his students with helping him live up to his own words, "Never give up." It was the children in Jim Aylesworth's life that lead him to a successful career of publishing over 30 books for children. Our favorite book this week by Jim Aylesworth was The Full Belly Bowl. It is a story of an older man that receives a bowl as a gift. He is given a warning to use it wisely, pour it out when finished, and store it upside down when not in use. The man learns that it is a magic bowl when he uses it to hold his stew. The bowl remained full even as he ate more and more. Then one morning, the man awakes to a house full of spiders and realizes that he left the bowl out all night for the spiders to crawl in. He man learns that the bowl is able to multiply anything that he places in and removes -- strawberries, buttons, and even coins! Jim Aylesworth said, "If my books somehow inspire a teacher to do an extension lesson, that would please me...Writing children's books is my way of being the teacher beyond the walls of my classroom for children that I may never know." (Patricia Newman). My children were so engaged during the reading of The Full Belly Bowl that I was inspired to do an extension activity. 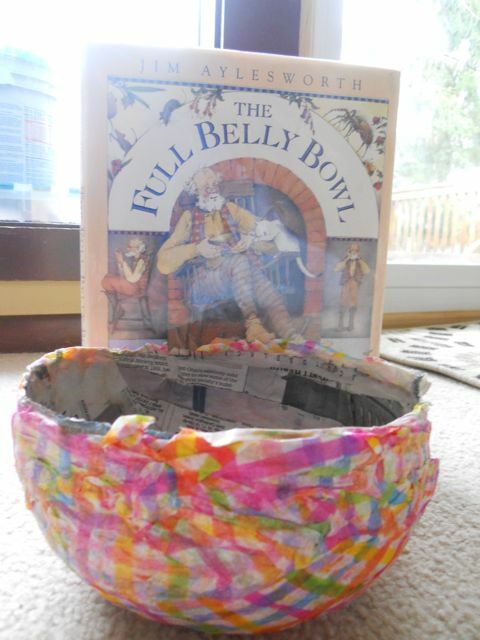 We ventured to make our own papier mache Full Belly Bowls. 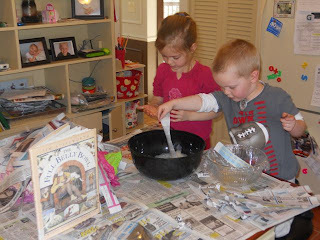 I researched many blogs on Pinterest on how to make papier mache bowls. I learned to cover a bowl with plastic wrap to use as a mold, and then apply the papier mache. There were many blogs that suggested covering the outside of your bowl and many others that said cover the inside. We tried both and found that we preferred to cover the outside of the bowl as it was easier to apply the paper strips and had a quicker drying time. To make our paste we boiled 5 parts water and 1 part flour for three minutes and let it cool (DTLK kids). While it was cooling we tore strips of newspaper 1-2 inches wide. Also, we made sure plastic wrap was secure. 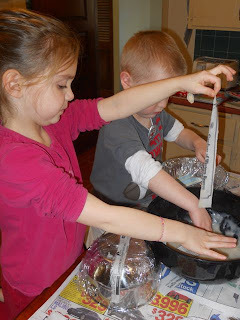 We did use tape in a few places to keep the plastic wrap from coming off the bowl. My children then dunked the newspaper strips in the paste, removed the excess, and applied the paste-coated strips to the plastic wrapped side of the bowl. We did 4 layers of strips on top of the plastic wrap covered bowl. After adding 4 layers we added a layer of colorful tissue paper. The bowls were set out over night to dry, but still weren't ready in the morning. It took two days and an intervention from the hair dryer to dry completely indoors. Make sure you do not remove the papier mache from the bowl because it will lose its shape as it dries completely. My daughter's Full Belly Bowl turned out wonderful (and so did my son's -- it just wasn't completely dry when I was taking pictures). She chose to give it to her great-grandparents for their 65th wedding anniversary. I loved this idea! We bought some chocolate hearts to put in the bowl to symbolize that their love will continue to be plentiful. We discovered that Jim Aylesworth's The Burger and the Hot Dog and The Cat and the Fiddle and More lend themselves to writing extension activities. On the last page of each of these books Jim Aylesworth invites the reader to extend the book by writing something of their own. In The Burger and the Hot Dog the reader is asked to write a poem about the "food folks" that they know. In The Cat and the Fiddle and More the reader is asked to write their own poem in the style of the popular nursery rhyme. There are so many opportunities for activities with books by Jim Aylesworth. Please share your thoughts on a favorite book or activity idea. Here is a photo of the Full Belly Bowl full of the chocolate hearts! 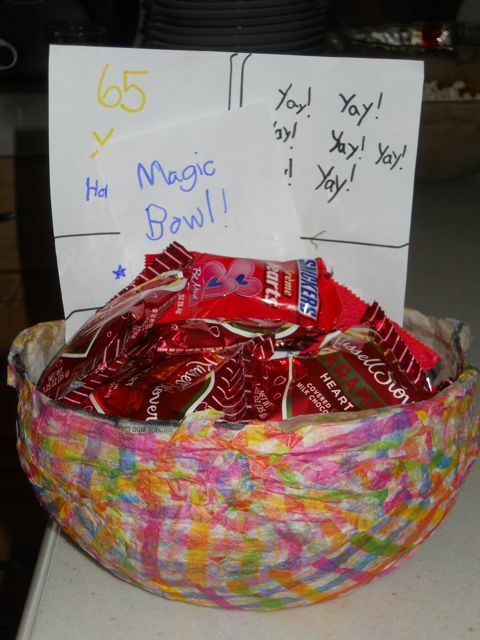 Notice my daughter's note informing her great-grandparents that it is indeed a "magic bowl"! Such a GREAT idea! And so sweet that your daughter thought to gift this masterpiece to her great-grandparents. She has such a wonderful heart -- you're so blessed! Thanks for sharing this, Eric. Thanks Colleen! I was so pleased with her thought to give the bowl to her great-grandparents! They loved the gift too! Your daughter is awesome -what a beautiful gift idea! I love the activity and I think we'll try making some full belly bowls here this weekend. Cheers! Thanks Heather! I think she is pretty swell too! Let me know if you try out the full belly bowls! My son wanted to see if he could use his bowl to multiply money and LEGOS! Great activity. I love your daughter's plans for it. I've never tried to make a bowl before, but we make a papier mache pinata every halloween. Yes, it takes a long time to dry. If I was going to make a bowl, I probably would have covered a balloon and then cut it in half. I would have never though to cover a real bowl. Very cute results! I saw ideas for using a balloon too! That would work too. Two bowls for the price of one! And another with fabric scraps - very pretty! Can you tell I like Pinterest? Wow Renee! Thanks for sharing those ideas. I really like the fabric scraps bowl too! Boy, that brought back some wonderful memories! Growing up, we used to make papier mache puppets and I had completely forgotten about them. Another amazing author, another terrific post that I'll post on my FB Fan Page. 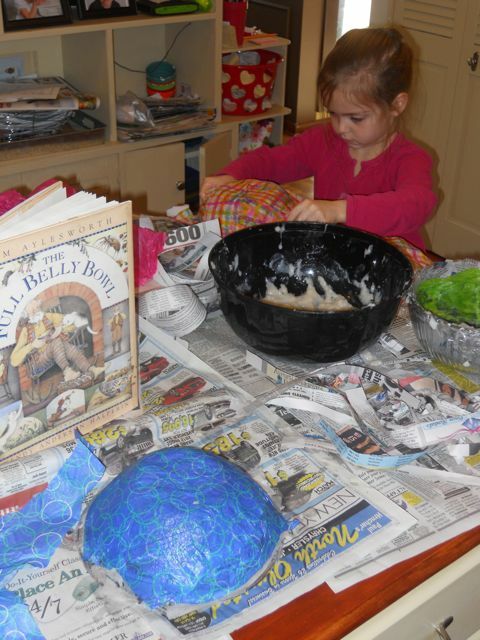 Papier mache is so much fun! I have never made papier mache puppets -- that would be cool! Thanks again for sharing the post! Myra, Jim Aylesworth was a new author for our family too. We really liked his books. I don't think you will be disappointed with his books. Lots of good ones! Thanks for reading my blog!